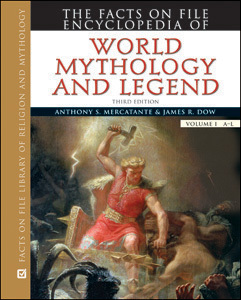 The Facts On File Encyclopedia of World Mythology and Legend, Third Edition is a complete revision that provides an even more extensive survey of myths, legends, and folklore from around the world. With assistance from a team of scholars, James R. Dow has revised and updated the entire text in this comprehensive resource. This edition boasts approximately 3,000 entries, 150 of which are new; a substantially updated bibliography; an overhauled art program, with hundreds of new images; and a new guide to Internet sources on world mythology and legend. Entries include important scholarly terms, figures important in folklore and mythology, the historical figures that have inspired myths and folklore, and the authors who wrote down folktales or used folklore and mythology extensively in their work. Many new entries focus on the mythology and folklore of Cambodia, Tibet, Ukraine, and other areas. "Earlier versions have been enthusiastically recommended, and this new edition is even better. Jammed with information and filled with both impressive scholarship and entertaining tidbits...highly recommended for all libraries." "...provide[s] smart, concise information...worth acquiring..."